Perhaps this blog has been a bit heavy on pictures lately, I'm not sure. On the other hand, I've got a lot to take pictures of. I live in a land named after flowers and people do seem to enjoy looking at them. When you have a blog or any web site, you can find out what people like to read about by looking at your analytics and web page "hits" and fill in the blanks. In the case of this site, people seem to hit my posting on propagation of Mexican Petunias. These Ruellias are all over the neighborhood. Here they are as common as Hosta are up North. I was walking past the neighbor's house the other day and these three purple beauties were lined in a row. Once I allowed the wind to die down, They lined up and smiled at me as such. I am considering my options with these plants. In front of my house I have a small garden. I had pulled out all the ferns that grew there as they were climbing up the Japanese Yew that I have on the corners of the windows and would grow outside of the flower box. Ferns have their own charm but they are only green. They have no other colour. In the case of the Mexican Petunias, I'd get that same dark green and a welcome touch of purple to add to it. Since I am a fan of propagating your own plants, I could go through that box with a weed eater and get rid of what is left and have a nice clean bit of sand that is under irrigation. 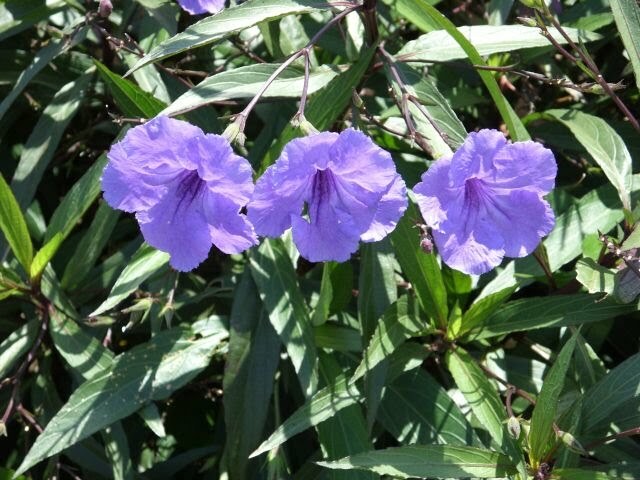 That is all one needs when you are trying to propagate Ruellia. Irrigated soil. I know this because that was all I had done for a pot of the stuff before. Cuttings from the garden that climbed inside the fence got stuck into a pot and almost all of them rooted and bloomed. It looked rather nice for a while until that irrigation line got cut and we went into the dry season. It took a while before I noticed and now that pot has a trumpet flower tree in it and some other odds and ends like Poinsettia. 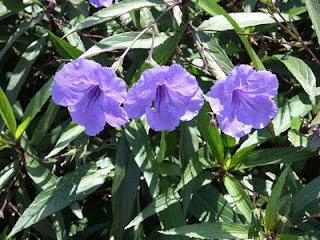 So if you're looking for Propagation of Mexican Petunia, take a cutting, stick it in a hole, water well. The plant should take. If you have patience that would be about all you need.